American Zombie: 'You need to go back and do your research..."
'You need to go back and do your research..."
Those were the marching orders I got from Troy Henry when I asked him about his claim that he was THE President of United Water. Ok...I took him up on it. Henry Consulting is currently being sued by their minority business partner, B3, in a joint venture they partnered in called Infinity Fuels, LLC. Infinity Fuels owns eight Shell gas stations in New Orleans and more in other metropolitan areas such as San Francisco and Detroit. While there are multiple issues against Henry Consulting, including charges by B3 that Henry violated the terms of their contract by going behind their back and soliciting business in other markets independently of Infinity, the primary concern for voters is that B3 is possibly suggesting that Troy Henry misappropriated Infinity's funds and Infinity clients' funds into his mayoral campaign...up to the amount of $395,000. I contacted the campaign today and requested that they please respond to me so I could ask them about the lawsuit and allegations. I did not receive a reply. I have been in contact with the campaign since my first post but I have no comments from them on the record. 1. Does Mr. Henry plan on complying with the subpoena and providing the financial transactions which prove that he, personally, provided the campaign funds as opposed to the funds being drawn from Henry Consulting, or from Infinity Feuls? 2. Can Mr. Henry verify the source of the funds...the 6 loans amounting to $380,000? 3. Are his campaign reports accurate and did his treasurer sign his last campaign financing report? 4. The 6th and largest loan, $180,000, was not listed in his original campaign finance report which was released after the loan was made. Why? Ok...I was lambasted for listing the previous contract with the City, which went unpaid, as proof that Henry Consulting had any contracts with the city. I subsequently posted a correction. 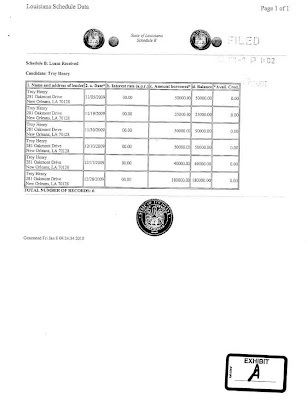 But this is a financial disclosure which clearly states a payment from the City...this is not just a contract. 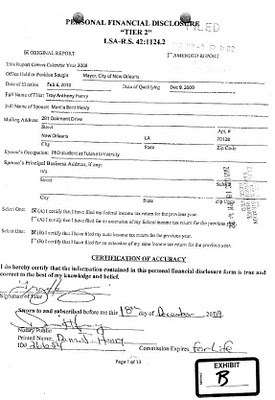 Am I wrong again in concluding that Henry Consulting was paid $9,000 from the City of New Orleans? Or maybe this was paid without an actual contract? Clearly, all of this can lead to only one conclusion: you're a racist. keep up the great work. i wish couhig had a shot. How the hell can anon #1 conclude that you are a racist from this post? I'm so confused! You have certainly wiped the dirt off my mirror, Az. I can see clearly now, the rain is gone! Thanks for all your hard work and for keeping us informed! BTW, aren't you in an interracial marriage? How then can you be a racist? Anon #1 may need to do some research! Isn't it clearly obvious? I am a racist: I am in an interracial marriage: I am a masochist. You're guess is as good as mine...that was fuzzy math. Dambala, I'm pretty sure anon was kidding. Isn't that what (j/k) means? Just kidding? He can't be serious, right? PS: Thanks for the post on Cine Institute. note the "(j/k)" at the end of post #1. Don't be so priggish! Nice work on the Henry background. keep it up. Excellent, excellent work, Ashe. U r a hero of mine. Can't believe that Henry didn't think this thing through any better than this. I hate that these guys want to oversee an electorate for which they have so little respect. Out 'em all. Henry: "Oh-oh! The people will know I have no clothes." How is this guy in a position to own one gas station, let alone nine here, some there, etc? Doe he sell insurance in Jeff Ph or something? people! j/k = just kidding. Yes, algebra does have imaginary numbers. Am interested in how you found the lawsuit if you can share. Hey, anon 1, I got the joke the first time. I laughed. Dambala, my hat is off to you. This was fabulous work. I was bored to see the name "Infinity" again. Can't these crooks think up some new names? There is no connection to the fake bond company called "Infinity", is there? Does Troy Henry have the same set of friends? A while ago, Zombie, you said that Henry had friends among the Nagin people, that he was getting the support of a lot of those lousy so-and-so's. Is that how he ended up with $9000 of City money? Am I following along correctly? Henry got $9000 of city money, and then probably used that tax payer money to fund his run for Mayor?